Not a typical blog, but a tidied-up version of the Headmaster’s closing remarks at our end of term Easter assembly, a gathering that brought spring term and an Old Bradfordians reunion at school to a close. “Good afternoon everyone and welcome to our end of term Easter assembly. 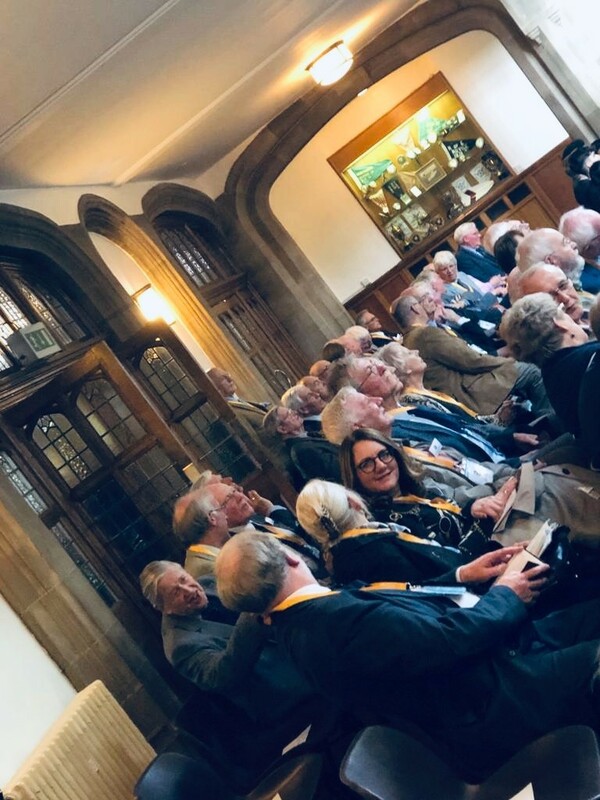 I extend a particularly warm welcome to our guests, Old Bradfordians who attended this great school back in the 1940s and the 1950s; they, and their guests, are in school today for a reunion … a reunion to remember past times, renew and strengthen bonds of friendship. It is great to have you with us today; and you will always be welcome at BGS. So here I stand, the 29th Headmaster of Bradford Grammar School, one of the oldest institutions in this city. You will know that we can trace our history back to 1548, although we knew that a predecessor of BGS existed before then. We know, for example, that a Saxon Church and school, such as it was back then, existed in Bradford before the Norman Conquest. However, it was after the Norman Conquest – the taming of the north and the establishment of castles and cathedrals – that the more recognisable Latin Grammar Schools came into existence. Latin was the language of religion, of commerce, of common law, the language of power and influence, and this is why church schools were established to teach it – Latin Grammar that is – to the rising professional classes. Latin Grammar Schools are known to have been founded in Wakefield in 1289, Ripon in 1348 and Doncaster in 1354. These are the oldest examples from our region. Bradford Grammar School is but a youngster in this context – a mere strip of a lad or lass. The precise date for the origin of BGS is unknown. However, as stated previously, we do know that it existed by 1548. The first Headmaster we know about (from a record dated 1563) – one of my predecessors – is a chap called Robert Hall. Robert was supported largely through the generosity of local landowner John Lacy, the school’s first known benefactor. Every year, of course, we remember, celebrate and give thanks to our benefactors on Founders Day. BGS faced many challenges during its early history and nearly closed on several occasions, sandwiched as it was between the crown and the church in a power struggle that lasted generations. In addition, a little Civil War skirmishing nearly finished us off in the 1640s. A degree of security came in 1662 when King Charles II granted the school its Royal. Charter. That document hangs in the DH room today. Not a copy, it is the real deal. So, we, The Free School of King Charles II in Bradford, was formally on the map and it looked like we were here to stay, located as we were in the 1660s just downhill from the cathedral where we celebrate our Founders’ Day. There we stayed until the school moved to a new purpose built site in 1820 at Manor Row, near what is now Bradford Forster Square train station. More change followed soon after as The Forster Reform Acts from 1870 wrested the school away from church control and placed it firmly in the hands of the state. The foundation stone for the new Bradford Grammar School, the one we know today, was laid at the Clock House Estate in Manningham on 24 July 1933. Once again, BGS was moving location. The building, this building, was nearly compete as war broke out in 1939, at which time it was taken over by the army as a barracks, to be given back in 1949 when it officially opened as a school. Some of the Old Bradfordians at the back of the Price Hall remember the old school at Manor Row, some remember this building when it was new. 1949. The modern day BGS is 70 years old this year. It is quite a landmark in the school’s history and we all share in this moment. At BGS we are not afraid to innovate, to move with the times, to move home, whilst staying loyal to Bradford; but we do not forget where we came from, our heritage, our people. Easter is a good time to reflect on these things. You heard a familiar Bible story earlier, with some modern day interpretation and examples threaded into the narrative. It is a story about struggle and trial. About death and the passage of time. It is also a story of renewal and rebirth, told at the turning of the seasons and the start of springtime. It is a story about hope. Successful communities like BGS have endured through the ages because they flex and move with the times, because they embrace and are responsive to cycles of change. In the brief history I gave earlier, you heard me tell of great change. Just consider how momentous and risky it was to move the school and rebuild it, on a scale such as this, during a period of great uncertainty, a time when the Second World War loomed large on the horizon. The school gambled and secured its future. More recently, when girls appeared at BGS for the first time, the school threw the dice again. Next year, we celebrate another key anniversary, 20 years of girls at BGS. Do not imagine that these changes were achieved without controversy or conflict. However, it is not in our nature to be timid. Informed and brave choices have shaped this school. You only notice these significant shifts when you look at the school over longer periods. When you are here, let’s say from Year 7 to 13, or for some, from Year 2 to Year 13, you might not see much movement. You might therefore imagine that the school never changes, that it is a fixed point in space and time. Well, talk to the Old Bradfordians at the back and they will tell you otherwise. There is a connection here with the Easter message – the idea of renewal and growth. Of moving forwards. Some things do stand the test of time. Hoc Age remains our cherished school motto and it speaks of the no nonsense ‘get on with it’ attitude that has characterised the school over generations. So, continuity and change. Old Bradfordians tell me they used to swim naked in the outdoor school pool … we don’t do that anymore (I hope) … but we still go swimming. Continuity and change. And, on that enigmatic note, it is time to end. Well done for all your enthusiasm and hard work this past term, which was self-evident at, for example, the brilliant Leavers Concert recently. It is now time to rest a little, to revise and prepare for public exams, to enjoy some fabulous school trips and to reconnect with family and friends.